For the Waverley Squadron of the Australian Air League, 28th September 2015 was a special day as it marked for the Squadron 45 years of continuous operation. To celebrate the occasion a special parade was held earlier this month in conjunction with the Squadron presentation night, celebrating this important milestone. 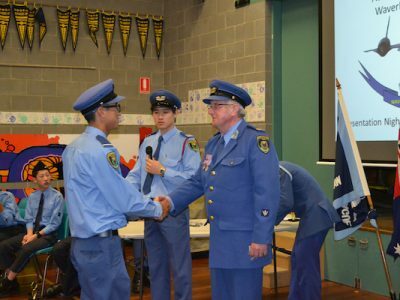 Held at Glen Waverley Primary School, the current Squadron meeting place, the parade was attended by the Victoria Group Staff Officers, former Squadron members, friends and family. Waverley Squadron was formed on the 28th of September 1970 and the first O.C of the Boys Squadron was Jack Dunstan who was assisted by 5 other Officers. A total of 47 new members joined up that day. The Squadron met on Thursday at the Syndal State School and as of today still meets on Thursday at the Glen Waverley Primary School. During the 1980’s the Squadron membership was over 100 cadets, having 3 flights and a flag party and a band on parade and was proudly the largest Squadron in Victoria. Unfortunately, during the 1990s the numbers had declined, although the current Squadron membership stands at 19 cadets and 4 Officers. On the night, the former longest serving O.C (Officer Commanding 1977- 2003) Group Commissioner Gordon Manning J.P M.S.A touched on the history and years of achievements when the Squadron first open to when he handed it over to Squadron Captain Simon Lumb (a former Squadron cadet and later Officer Commanding Squadron). Some of Waverley Squadron’s most notable achievements were in 1977 winning Best Band in Victoria and Best Drum Major. The Band then won for the next 6 years and best drum Major for the next 7 years. The Squadron Band was invited to participate in the Military Tattoo at the Royal Melbourne show grounds, and also performed at the VFL Park and Waverley half time Night football grand final. The Squadron also appeared on the Channel 7 TV show “Shirl’s Neighbourhood” in 1980. In 1981, the Squadron was invited again by C7’s Ron Casey to provide a Flag Party for the introduction of World of Sport, they appeared on the opening of the show. Amongst the more recent achievements of the Squadron, it produced two Federal cadet of year the winners Cpl Peter Brennan (2010) and Cpl Ben Tam i(2015) as well as four Victorian cadet of year winners Cpl. Peter Brennan (2009) and Cpl. Ramon Raux (2011), L/Cdt Emily Ward (2009) and L/cdt Ben Tam (2013). “I first join the Air League in 2005 as a young cadet, Waverley Squadron’s O.C at the time was Simon Lumb, and the Squadron Officers were Gordon Manning and Lorna Keay (former Squadron O.C 2007 – 2009). In the course of 10 years the Squadron had gone through a lot of changes, new members come and go and left their marks, and many achievements that help put Waverley Squadron name out there. It’s fantastic to be part of a Squadron that has quite a history behind it and I’m sure many more years will be added in the future. I would like thank all the past O.C for being my role model and mentors when I was a cadet, I will definitely try to pass on what I have learnt to my cadets. I’m very happy with the current progress of the Squadron, as Waverley has a keen and enthusiastic bunch of young cadets who are eager to learn and strive for success. I am looking forward to see the Squadron grow and hope the Squadron continues to achieve great things for many years to come. More photos of the night can be found here.